Aug 31, 2011 The question “How many keys are one a piano1?” may seem rather childish, but not everybody can give the correct answer to it. We will not keep you in suspense. Standard modern pianos have 88 keys. But this answer is not comprehensive, because there are also pianos with other numbers of keys. If you want to know more about this musical instrument, keep on reading. Bartolomeo Cristofori, a harpsichord maker from Padua, Italy, is said to be the inventor of the modern variant of the piano. Nobody can say when exactly this happened, but it is known that by 1700 the Medici family, whom he worked for, had such an instrument. First pianos had wooden frames and unique keyboard mechanisms. In general, they resembled clavichords, which had been invented formerly. Since that time their design and functionality have undergone significant changes. You have already read above that a standard piano has 88 keys. But if you want to understand their layout better, you should get some more information about the instrument. First keyboards of early musical instruments had no black keys on them, and the key layout of those times consisted of seven notes. The modern variant was established in the 13th century in Europe. It consisted of twelve notes. Seven white keys and five black keys form an octave. As you already know, now pianos have 88 keys, that is, 7¼ octaves. As a rule, there are 52 white keys and 36 black keys on a regular piano. However, not only standard 88 key pianos are used now. Some well-known piano makers produce instruments with different number of keys. For example, there are 92 of them in Bösendorfer 225, and even 97 keys in Bösendorfer 290. The so-called “Cottage piano” misses bottom octave and top octave and has only 64 keys. Many years ago the Pleyel Company made the double grand piano, which combined two pianos. It had 176 piano keys. Nowadays, there are two basic categories of pianos: grand and upright. They are usually subdivided into baby grand, concert grand, small upright and large upright. The table below will give you some information about them. The largest piano in the world was made by Challen England in 1935. It was 11’8” long and weighed more than one and a quarter tons. 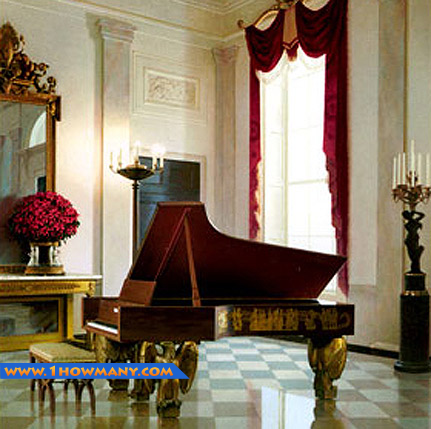 The Steinway Grand Piano, located in the White House. The piano is a very popular musical instrument, which is played with the help of a keyboard. The standard piano keyboard has 88 keys (52 white keys and 36 black keys). Pianos are widely used for chamber music, solo performances, accompaniment, etc.